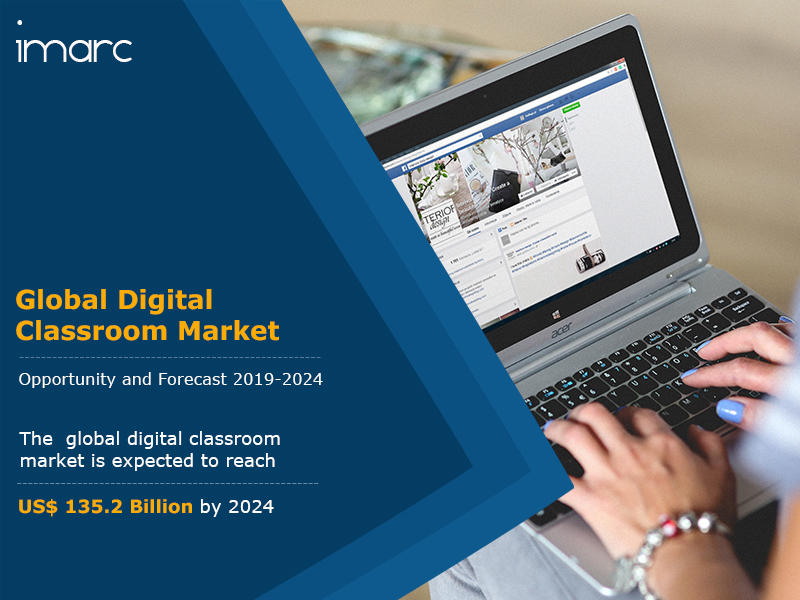 The global digital classroom market was worth around US$ 75.9 Billion in 2018. A digital classroom refers to a technology-enabled classroom which facilitates the learning process of students. It incorporates several hardware and software components such as personal computers, projectors, interactive whiteboards (IWBs), lecture capture solutions, enterprise resource planning systems (ERP), student information systems (SIS), student administrative software (SAS) and learning content management systems (LCMS). As digital classrooms offer an interactive way of imparting knowledge and assist students in retaining the acquired knowledge for a longer time, their demand is proliferating in schools and universities across the globe. Looking forward, the market is projected to reach a value of around US$ 135.2 Billion by 2024, expanding at a CAGR of around 10% during 2019-2024. Nowadays, governments across the globe are undertaking initiatives for improving teaching methods, quality of education and infrastructure of educational institutions. For instance, many governments are introducing the concept of smart classrooms in order to improve the education system. This is also contributing in the transformation of the learning system in both the K-12 and higher education segments. On account of strong internet penetration, students now prefer online sources for gathering information on a topic. In addition to this, technological advancements across the globe are also strengthening the growth of the digital classrooms market. Digital classrooms provide teachers with the ability to analyze and assess the skills learned by the students in real time while providing instant feedback on their performance. Owing to this, students can have a more transparent outlook on their performance and other contributions on a regular basis. As cloud computing facilities assist in minimizing the information technology expenditure, the introduction of learning analytics and cloud computing in digital classrooms is also expected to impel the growth of the market in the coming years. Based on the product type, the market has been segmented into digital classroom hardware, digital classroom content and digital classroom software. The digital classroom hardware segment currently accounts for the largest share. Based on the application, the market has been segmented into K-12 and higher education. Region-wise, the market has been segmented into North America, Europe, Asia Pacific, Middle East and Africa, and Latin America. Amongst these, North America is the biggest market, accounting for the majority of the global share. The competitive landscape of the market has also been examined with some of the key players being Dell, Jenzabar, Blackboard, Discovery Education, Pearson Education, Promethean World Ltd, Oracle, Educomp, Ellucian, Echo360, D2L, Unit4, Saba, Smart Technologies, DreamBox Learning and McGraw-Hill Education. How has the global digital classroom market performed so far and how will it perform in the coming years? What is the breakup of the global digital classroom market on the basis of region? What is the breakup of the global digital classroom market on the basis of product type? What is the breakup of the global digital classroom market on the basis of application? What are the various stages in the value chain of the global digital classroom market? What are the key driving factors and challenges in the global digital classroom market? 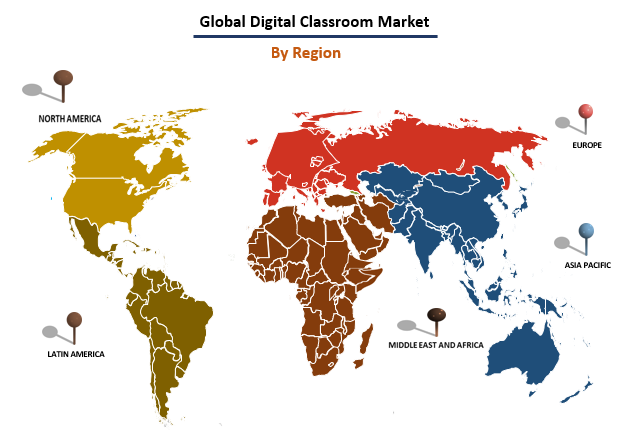 What is the structure of the global digital classroom market and who are the key players? What is the degree of competition in the global digital classroom market?